In the premier of the FastModel Motion Offense Forum last week, we introduced the foundation of motion offense – the basket cut. Building the habit of basket cutting is essential to motion offense and it leads us to our next progressions. There are new concept to be introduced, but the basket cut will be referred back to often. Today, let’s begin by learning the basic downscreen, the four cuts that are used in motion offense and introduce some methods of teaching them. The four cuts fit neatly into two categories. To isolate these actions and teach timing in detail, using the drill 1/0 With Chair is a good starting point. Set up a folding chair on the court with the back of the chair angled towards the top of the circle. This emulates the eventual position of the screener when executing a downscreen. “Walk the arc” (Don Meyer) – this refers to setting up the cut and using a change of tempo to use the screen effectively. 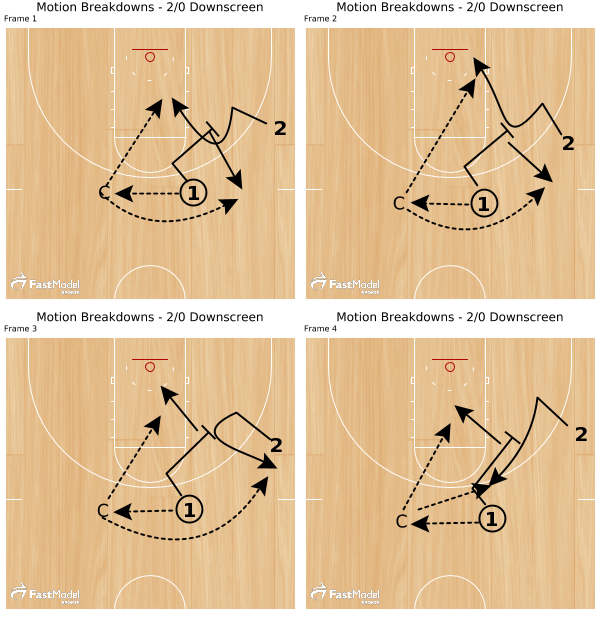 Players should walk into the set up and get to the plane of the screener (chair). Sprint the cut directly at the chair! Make sure you run the drill on both side of the floor. Optimally, there would be four lines and four chairs with two on each end plus a coach passing and players rotating through the drill all over the gym! It should be loud with players calling cuts. This is your basic shooting drill for motion offense. Set the chairs up before and after practice and players can partner and run these cuts on their own. Game shots, game shots, at game speed! After the cuts are introduced, it is time to progress to the introduction of the downscreen. 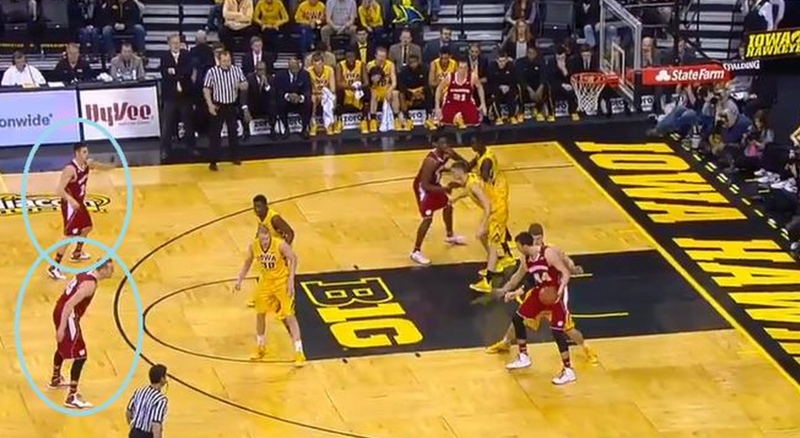 The downscreen is the most common screen in motion offense. If you run four-out, three-out/two-in or five out, it does not matter, players will set downscreens. The first step in the downscreen is the basket cut. After passing, the player must basket cut. If the defender does not jump to the ball then there is a give-and-go opportunity. But assuming the defender jumps to the ball on the pass, the basket cut gets him on the ball side and frees the player to make a downscreen. The basket cut sets the screening angle for the downscreen. In this 2/0 drill emphasize a hard step with the near foot after the pass is made from the slot to the coach. Cutters: when pass is made to coach, begin walking the arc and setting up the cut. Screeners: Talk! Call the screen. “Joey! Joey! Downscreen!” Throw up a fist as a signal as well. Coaches: Empasize the concept of second cutters! If the cutter makes an inside cut, the screener makes an outside cut and vice versa. Coaches: Always pass to the cutter first in this drill. Coaches: On the out cut, the screener must change the angle of the screen and pin imaginary defender into the lane! Progress through the cuts and flip the drill and run it on both sides of the floor. This is a foundation drill that is a shooting drill for motion teams. These are your shots and the ones to be practicing. Use them during a pregame warm up! Game shots, game spots, at game speed! 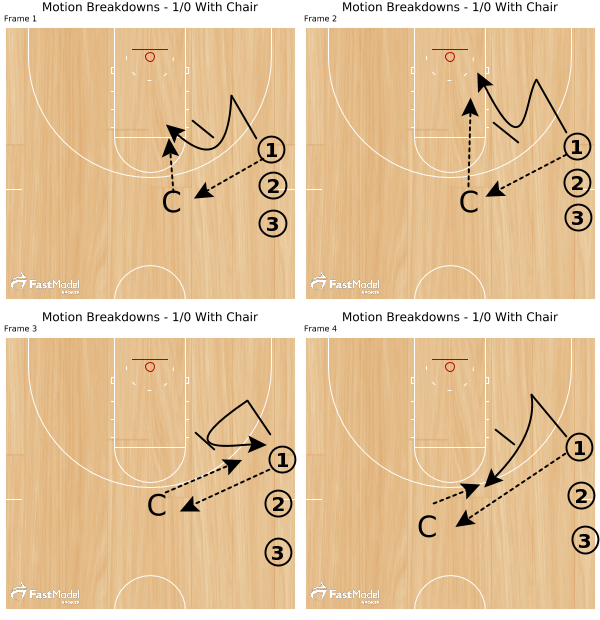 Building these motion offense habits are essential before adding defenders and going live. Players should grasp the concepts of walking the arc, running tight to the screen, second cutters, jump-stopping into the screen before progressing. Use the Twitter hashtag #MotionOffenseTips as well! Any questions: randy@radiusathletics.com Happy to talk hoops any time day or night! If you would like to be added to the motion offense mailing list, email and let me know! How long do you use these 1/0 to 4/0 drills in the preseason before progressing into the next phase with defenders?